One hit wonders Hoobastank (remember “The Reason”?) gave us a deeper insight of their journey during the press conference held at Hard Rock Hotel. Commemorating their success as a band for the past 10 years, Hoobastank revealed the struggles they had to overcome as they parted from their record label. According to the band, record labels were only concerned with producing the “The Reason” Mark II and were not genuinely interested in the well being of the band or their music. 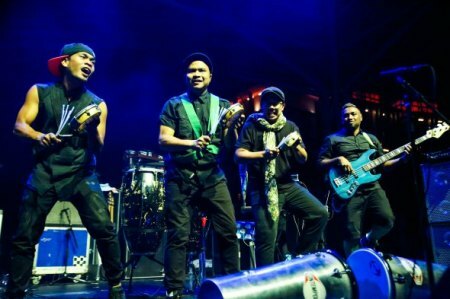 Being independent now, the band is able to allow their creative juices to flow. Released in 2012, Fight or Flight was perceived as a mellower approach compared to previous releases. For once the album was a collective effort by all the band members which enabled more originality. Inspirations revolved around the duties of being a father from Dough’s perspective as seen from the composition of “Magnolia”. Interestingly the heartbeat of his daughter was incorporated into this track too! From the press con, we also learned that the lads love Japan – “the fans are crazy and we have been playing there very often” and that the band will be spending more time with their families in the immediate future, besides of course playing more shows and releasing more new music. Filled with gusto and vigour, Wicked Aura Batucada (above) blew the house down as the opening act. Held at Hard Rock Hotel- The Coliseum, by 7.30pm the place was teeming with matured adults and for once there were no overly enthusiastic girls screaming for the bands. Known for their rapid and cohesive percussion beats, Wicked Aura is no doubt the reigning champion of percussive instruments. They were filled with fervour throughout their 30 minutes slot. It was a spellbinding performance which led the audience to dive into a trance. I love the melding of the different percussive instruments which added simultaneous layers to their overall set. After an interval, the true rock stars graced the stage. Clad in casual wear, Hoobastank greeted the crowd and got down to business. Some may have branded Hoobastank to be ‘once that disillusioned swath of maturing punks’. However they owned the night yesterday. The audience was given a taste of their latest album Fight or Flight with songs like “No Destination”. I guess the saying old is better than new makes sense in Hoobastank’s case, the audience responded better to their older tracks such as “Running Away” and “My Turn”. Proving to us that despite being longer in the tooth somewhat, Hoobastank still retained their husky vocals with the frequent emotional screams that let to a heartfelt testament. Guitar riffs which yowled and howled with segued nicely. Leaving the best for last, “The Reason” had many ardent fans crooning away with the band. This is by far the best track which they delivered from all their albums. A genuine single which talks about the struggles- meeting the standards set by others for us. 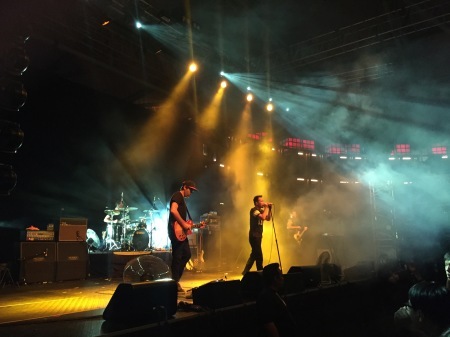 Hoobastank showed us that despite their age, they still brought their ‘A’ game to Singapore. Such as engaging the crowd by mimicking his screams and echoing phrases to “My Turn”, head bangs were frequent as light sticks lit the room. Voices were lost at the end of the day from all the warbling with the band. More fans should have been there but it was a great way to end a Sunday! Thanks to Colin Binns/Impact Entertainment Group for making this review possible.